Man I love those old Cheap Trick back covers from the 70’s. Opening for KISS back in 1977 must have had something to do with the word ‘Gimmick’. Cheap Trick didn’t really need a gimmick so to speak as those 70’s records of their hold their own musically. Perhaps since there were 1000’s of acts trying to make a name for themselves back than Cheap Trick did although break through with the Budokan album in 79 and that album my friends is no Gimmick! 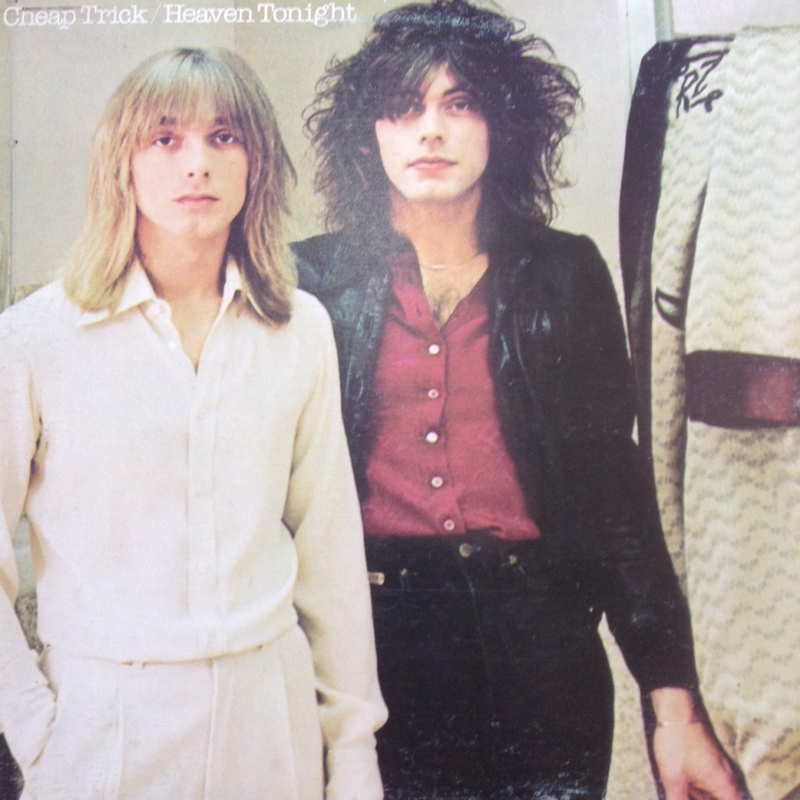 But let’s rewind a bit to 1978 when Trick released the Brilliant Heaven Tonight album. ( I will review this album in full down the road). In a first here with my Back Covers segment I need to post a pic of the front cover to get my point across! There ya have it. The two Rock Stars hanging outside while the two Geeks are checking and sprucing themselves up in the Bathroom! Reid Miles did the photography for this album and captures a band on the rise. The imagery between the front and back cover as a selling point is Awesome! If you notice on the back cover pic Rick has the album cover of 1977’s ‘In Color’ tucked in his back pocket! A little self promotion of your previous record never hurt anyone! Don’t feel bad though for the two nerds of Cheap Trick as if you spin the classic Budokan Album you will hear a ton of Japanese girls shrieking “Buuuuuuun E!’ while Rick wrote basically all the Cheap Trick songs! Special mention to Bun E Carlos who is credited as playing ‘Traps’ on the back cover! This is, currently, the only CT studio album I own! I never understood the whole front/back thing with CT. But it worked for them! Hah! I did like that there was a continuity from album to album. I never understood it, but there’s Robin and Jon on the front! By the 80’s they dropped the front cover cool guy stuff until Lap of Luxury once Tom comeback they did it on that one but it was nowhere as cool as the 70’s stuff…. Never looked at it that way, but you are right. Cool in the front, nerd in the back. However, don’t the nerds rule the world now. Are you only picking back covers with amazing ‘taches these days? Wow great call HMO….Dawson and Bun E should form a band a call it Pornstachepoloza! Love me some Cheap Trick. Have you seen a film called “Rock and Rule”? Killer animated film featuring Robin Zander doing voiceovers. Check it out if you can find it. Never heard of it…but will look for it now.. Thanks for the link sir! Love the Cheap Trick covers. I’d be with the nerds in the bathroom! I read an essay recently that argued (among other things) Cheap Trick had the best band name font style in rock – it’s a good one. And good for the nerds! Now thats a cool fact about the font! Well Geoff the movie ‘Revenge of the Nerds’ movie was a big one back and I mean way back when I was in Grade 11! Heck yes this is a classic. 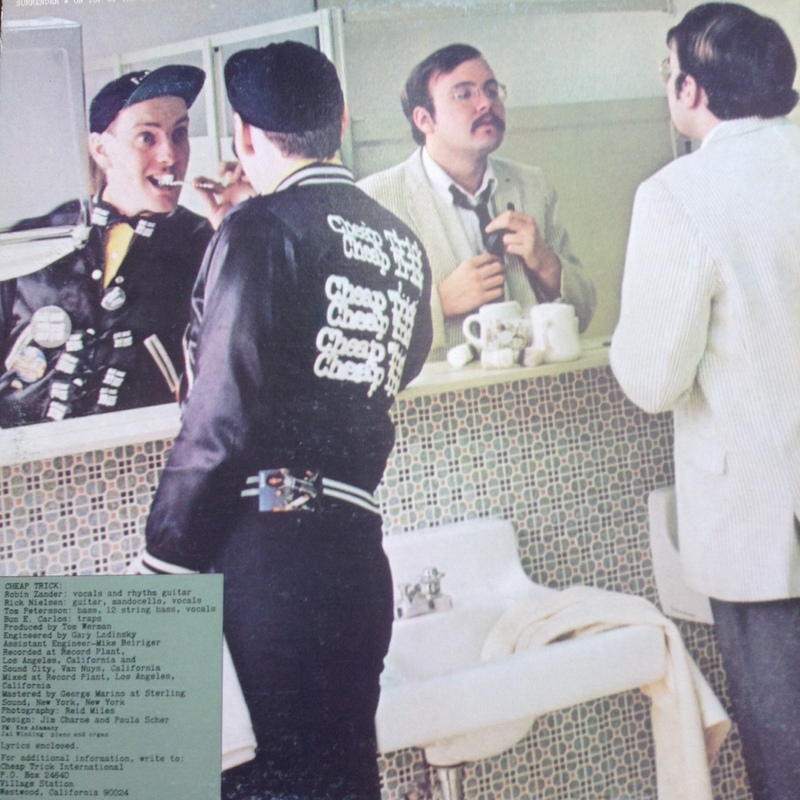 Genuinely love the Cheap Trick back covers… always celebrating their nerds! Yeah they were brilliant both on record and the covers as well!